Eicosanoids and sand fly saliva have a critical role in the Leishmania infection. Here, we evaluated the effect of Lutzomyia longipalpis salivary gland sonicate (SGS) on neutrophil and monocyte recruitment and activation of eicosanoid production in a murine model of inflammation. C57BL/6 mice were inoculated intraperitonealy with Lutzomyia longipalpis SGS or Leishmania infantum or both, followed by analyses of cell recruitment, parasite load and eicosanoid production. Intraperitoneal injection of Lutzomyia longipalpis SGS together with Leishmania infantum induced an early increased parasite viability in monocytes and neutrophils. L. longipalpis SGS increased prostaglandin E2 (PGE2), but reduced leukotriene B4 (LTB4) production ex vivo in peritoneal leukocytes. In addition, the pharmacological inhibition of cyclooxygenase 2 (COX-2) with NS-398 decreased parasite viability inside macrophages during Leishmania infection in the presence of L. longipalpis SGS arguing that PGE2 production is associated with diminished parasite killing. These findings indicate that L. longipalpis SGS is a critical factor driving immune evasion of Leishmania through modulation of PGE2/LTB4 axis, which may represent an important mechanism on establishment of the infection. Leishmania infantum in America is transmitted by the bite of infected Lutzomyia longipalpis sand flies. Transmission of Leishmania sp. by hematophagous sand fly vectors occurs during blood feeding, when salivary content is inoculated with regurgitated Leishmania into host skin. Sand fly saliva enhances Leishmania infection on several experimental models - through its modulatory effects on the host immune system ,. A successful blood feeding depends on the formation of a blood hemorrhagic pool . In such a microenvironment there are many inflammatory cells , and L. longipalpis saliva has been shown to enhance recruitment of different cells, including monocytes and neutrophils -. Eicosanoids display an important role during Leishmania infection -. In this context, there are results showing that Prostaglandin E2 (PGE2) production benefits parasite survival - while Leukotriene B4 (LTB4) is related with parasite killing by host cells ,,. In addition, sand fly saliva seems to modulate the eicosanoid production by host cells in a polarized way towards PGE2,,,. Maxadilan, a vasodilatory peptide present in L. longipalpis salivary glands, is shown to increase production of PGE2 by macrophages . 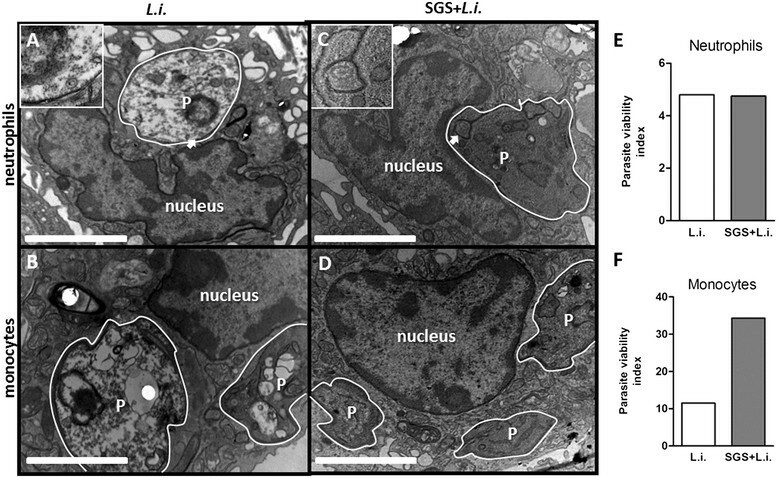 L. longipalpis salivary gland sonicate (SGS) is able to modulate PGE2 and LTB4 release in monocytes and neutrophils recruited to the peritoneal cavity . In neutrophils, SGS increases L. infantum infection-driven production of PGE2in vitro. 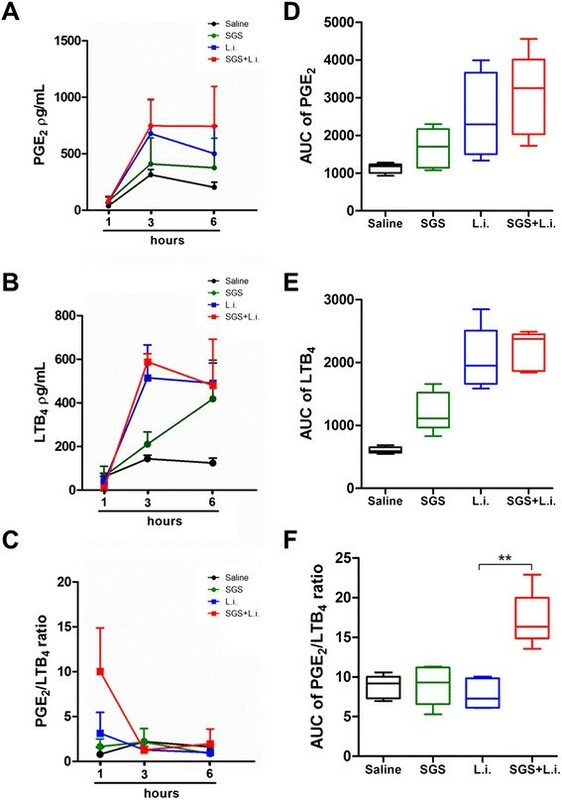 However, it remains to be addressed whether sand fly saliva can benefit Leishmania infection by control of PGE2/LTB4 axis during early steps of infection in vivo. In the present study, we explore the effect of L. longipalpis SGS on the PGE2/LTB4 balance in the context of L. infantum infection in vivo using the peritoneal model in mice. In addition, we demonstrate that PGE2/LTB4 balance can be important for modulation of immune response elicited by SGS allowing increase in parasite viability as well as parasite burden inside leukocytes during early moments of exposure to L. infantum. Schneider’s insect medium, N-(1-naphthyl)-ethylenediamine and p-Aminobenzene-sulfanilamide were purchased from SIGMA (St. Louis, MO). RPMI 1640 medium and L-glutamine, penicillin, and streptomycin were from Invitrogen (Carlsbad, CA, USA). Nutridoma-SP was from Roche (Indianapolis, In, USA). A23187 calcium ionophore was from Calbiochem Novabiochem Corp. (La Jolla, CA). NS-398, PGE2 and LTB4 enzyme-linked immunoassay (EIA) Kits were from Cayman Chemical (Ann Arbor, MI). Dimethylsulfoxide (DMSO) was purchased from ACROS Organics (New Jersey, NJ). All experiments were performed in strict accordance with the recommendations of the Brazilian National Council for the Control of Animal Experimentation (CONCEA). The Ethics Committee on the use of experimental animals (CEUA) of the Centro de Pesquisas Gonçalo Moniz, Fundação Oswaldo Cruz approved all protocols (Permit Number: 27/2008). Inbred male C57BL/6 mice, age 6–8 weeks, were obtained from the animal facility at Centro de Pesquisas Gonçalo Moniz, Fundação Oswaldo Cruz (CPqGM-FIOCRUZ, Bahia, Brazil). The animals were kept at a temperature of 24°C, with free access to food and water and light and dark cycles of 12 hours each. L. infantum (MCAN/BR/89/BA262) promastigotes were cultured at 25°C in Schneider’s insect medium supplemented with 20% inactive FBS, 2 mM L-glutamine, 100 U/ml penicillin, and 100 μg/ml streptomycin. Stationary phase promastigotes were used in all experiments. Adult Lutzomyia longipalpis captured in Cavunge (Bahia, Brazil) were reared at the Laboratório de Imunoparasitologia/CPqGM/FIOCRUZ (Bahia, Brazil) as described previously . Salivary glands were dissected from 5- to 7-day-old L. longipalpis females under a stereoscopic microscope (Stemi 2000, Carls Zeiss, Jena, Germany) and stored in groups of 10 pairs in 10 μl endotoxin-free PBS at −70°C. Immediately before use, glands were sonicated (Sonifier 450, Brason, Danbury, CT) and centrifuged at 10,000 × g for 4 minutes. The supernatants of salivary gland sonicate (SGS) were used for the experiments. The level of LPS contamination of SGS preparations was determined using a commercially available LAL Chromogenic Kit (QCL-1000, Lonza Bioscience) resulting in negligible levels of endotoxin in the salivary gland supernatant. All experimental procedures used SGS equivalent to 0.5 pair of salivary gland per group which possesses approximately 0.7 micrograms of proteins . C57BL/6 mice were submitted to intra-peritoneal (i.p.) injection with 0.1 ml of SGS (0.5 pair/cavity), 0.1 ml of L. infantum promastigotes from stationary phase (3 × 106/cavity), 0.1 ml of endotoxin-free saline per cavity (negative control) or 0.1 ml of LPS (20 μg/ml; positive control-data not shown). One hour after the stimulus the total leukocytes that migrated to the peritoneal cavity was harvested by peritoneal lavage with injection of 10 ml endotoxin-free saline. Alternatively, C57BL/6 mice were previously treated with an i.p. injection of NS398 2 mg/kg or DMSO as a vehicle control. Total counts were performed on a Neubauer hemocytometer after staining with Turk’s solution. Differential cell counts (200 cells total) of infected cells were carried out microscopically on cytospin preparations stained with Diff-Quick. Intracellular load of L. infantum was estimated by production of proliferating extracellular motile promastigotes in Schneider medium . Briefly, after 1 h of infection, peritoneal cells were centrifuged, supernatants containing non-internalized promastigotes were removed and medium was replaced by 250 μl of Schneider medium supplemented with 20% inactive FBS, 2 mM L-glutamine, 100 U/ml penicillin, and 100 μg/ml streptomycin. Infected cells were cultured at 25°C for additional 3 days. In the third day promastigotes in the cultures were counted in a Neubauer hemocytometer. Peritoneal cells from mice infected with L. infantum were centrifuged (1500 rpm, 10 min) and the pellets were resuspended and fixed in a mixture of freshly prepared aldehydes (1% paraformaldehyde and 1% glutaraldehyde) in 0.1 M phosphate buffer, pH7.4 overnight at 4°C. The cells were washed in the same buffer and embedded in molten 2% agar (Merk). Agar pellets containing the cells were post-fixed in a mixture of 1% phosphate-buffered osmium tetroxide and 1.5% potassium ferrocyanide (final concentration) for 1 h and processed for resin embedding (PolyBed 812, Polysciences, Warrington, PA). The section were mounted on uncoated 200-mesh copper grids and observed through a transmission electron microscope (EM 109; Zeiss, Germany). Electron micrographs were randomly taken at the magnifications of 7 000 – 30 000X to study the entire cell profile. Viable parasites inside infected neutrophils and monocytes were enumerated by electron microscopy and presented as parasite viability index which is the ratio of percentage of viable parasite by the mean of parasites per infected cells. Parasites were considered dead according chromatin condensation and presence of cytoplasmic disorganization and vacuolization. PGE2 and LTB4 levels were measured ex vivo from leukocytes harvested by peritoneal cavity washing with Ca2+-Mg2+-free HBSS. Afterwards, recovered cells (1 × 106 cells/ml) were resuspended in HBSS contained Ca2+-Mg2+ and then stimulated with A23187 (0.5 μM) for 15 min. Reactions were stopped on ice, and samples were centrifuged at 500 × g for 10 min at 4°C. Supernatants were collected to measure PGE2 and LTB4 by enzyme-linked immunoassay (EIA), according to manufacturer’s instructions. The assays were performed using at least five mice per group. Each experiment was repeated at least three times. The data are presented as the mean and SEM (standard error) of representative experiments and were analyzed using the GraphPad Prism 5.0 software (GraphPad Software, San Diego, CA, USA). Kinetic data were alternatively shown as bars graphs with area under curves calculated using GraphPad Prism 5.0 software. The comparisons between two groups were analyzed using Mann–Whitney test. The differences were considered statistically significant when p ≤ 0.05. 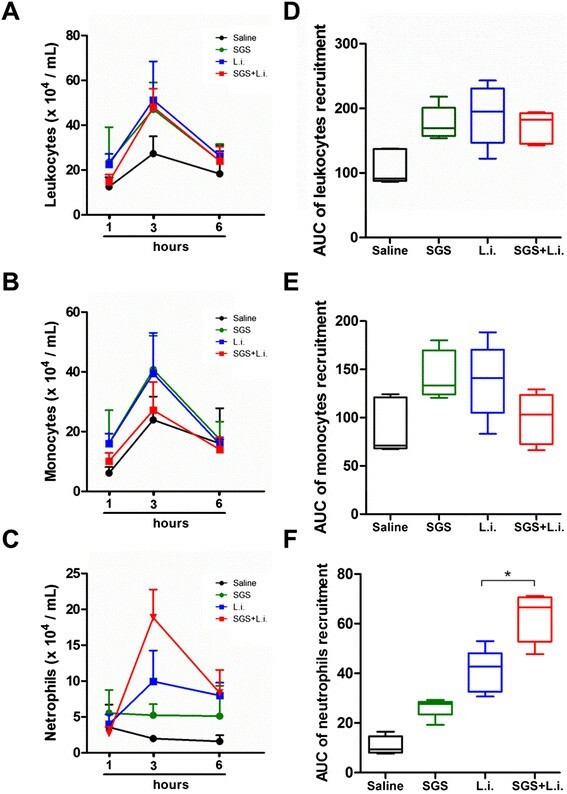 L. longipalpis SGS and L. infantum modulate early leucocyte recruitment and eicosanoids production ex vivo. We have previously shown that the main cell types recruited to the inoculation site by L. longipalpis saliva are neutrophils and monocytes ,,. Here we observed an early recruitment kinetic of total leukocytes (Figure 1A), monocytes (Figure 1B) and neutrophils (Figure 1C) in the peritoneal cavity. L. infantum inoculation with SGS did not alter the number of total leukocytes (Figure 1D) and monocytes (Figure 1E), but there was a significant increase in the number of neutrophils (Figure 1F). Leukocyte recruitment in response to L. longipalpis SGS during L. infantum infection. C57BL/6 mice were injected i.p. with saline (control), L. infantum and/or SGS as described in methods. One, 3 and 6 hours after stimulation, peritoneal cavities were washed and cells were harvested. Kinetics of total leucocytes (A), monocytes (B) and neutrophils (C) were estimated using Diff-Quick-stained cytospin preparations. Area Under Curve (AUC) of the kinetic of total leukocytes (D), monocytes (E) and neutrophils (F) recruitment. The data are the means and SEM from an experiment representative of three independent experiments. n = 5 per group. (*, p < 0.05 and Mann–Whitney test, two-tailed). Different classes of eicosanoids, such as PGE2 and LTB4, promote both cellular recruitment and removal of inflammatory cells coordinating the initial events of inflammation . We have previously demonstrated that injection of L. longipalpis saliva in the peritoneal cavity induced PGE2 and LTB4 production . In the present study we investigated whether the presence of L. infantum alters the levels of PGE2 and LTB4 production induced by L. longipalpis saliva. Addition of L. longipalpis SGS to L. infantum inoculation did not alter PGE2 (Figure 2A,D) and LTB4 (Figure 2B,E) levels significantly at the time points evaluated. Considering the fact that PGE2 and LTB4 exhibit antagonistic effects on inflammation and Leishmania infection ,,-,, we plotted the PGE2/LTB4 ratio, following analysis of Area Under Curve (AUC) of the kinetic of these inflammatory mediators (Figure 2C,F). Injection of L. longipalpis salivary components plus L. infantum triggered high PGE2/LTB4 ratio (Figure 2F). However, this additive effect was evident only 1 hour after stimulation (Figure 2C). PGE2 levels were undetectable when directly measured in the exudates (not shown). PGE 2 and LTB 4 production in response to L. longipalpis SGS during L. infantum infection. C57BL/6 mice were injected i.p. with saline (control), L. infantum and/or SGS. One, 3 and 6 hours after stimulation, peritoneal cavities were washed and cells were harvested. The cells were then incubated with A23187 (0.5 mM) for 15 min at 37°C to evaluate LTB4 and PGE2 production. The concentrations of PGE2(A) and LTB4(B) in the supernatant were measured by ELISA. (C) Shows the PGE2/LTB4 ratio. Area Under Curve (AUC) of the kinetic of PGE2(D), LTB4(E) and PGE2/LTB4 ratio (F). The data are the means and SEM from an experiment representative of three independent experiments. n = 5 per group. (*, p < 0.05 and Mann–Whitney test, two-tailed). L. longipalpis SGS enhances parasite viability during L. infantum infection in vivo. Infected neutrophils and monocytes were observed in recovered cells from peritoneal cavity after 1 hour of inoculation of L. longipalpis SGS plus L. infantum (Figure 3A). The number of viable parasites from these cell cultures was increased significantly in the presence of L. longipalpis SGS (Figure 3B). Infected neutrophils and monocytes were not observed in later time points than 1 hour in recovered cells from the peritoneal cavity (not shown). L. longipalpis SGS favors L. infantum survival inside neutrophils and monocytes. C57BL/6 mice were inoculated with L. infantum and/or SGS. (A) Illustration of peritoneal infected neutrophil (upper) and macrophage (bottom) stained with Diff-Quick after 1 h of inoculation. (B) Viable parasites counting recovered by total infected peritoneal cells. The data are the means and SEM from an experiment representative of three independent experiments. n = 5 per group. (*, p < 0.05 and Mann–Whitney test, two-tailed). We have also evaluated the presence of parasites inside peritoneal neutrophils and monocytes by transmission electron microscopy (Figure 4A-D) after 1 hour post in vivo inoculation. Cells recovered from mice injected with L. infantum alone frequently presented degenerated parasite with chromatin condensation, cytoplasmic disorganization and vacuolization inside the vacuoles in neutrophils (Figure 4A) and monocytes (Figure 4B). 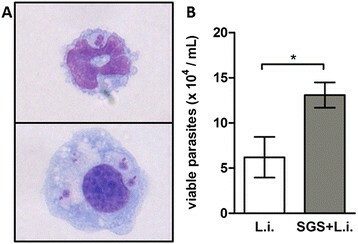 In contrast, when L. longipalpis SGS was inoculated together with Leishmania, viable parasites were recurrently observed in both neutrophils (Figure 4C) and monocytes (Figure 4D). However, the parasite viability was increased only inside monocytes (Figure 4F), but not neutrophils (Figure 4E) as shown by analysis of electron microscopy sections (Figure 4). L. longipalpis SGS favors viability of L. infantum inside peritoneal cells. C57BL/6 mice were inoculated with L infantum and/or SGS. Transmission electron microscopic images of peritoneal cells after 1 h of infection with L. infantum are shown. Degraded L. infantum inside neutrophils (A) and monocytes (B) are showed. Viable parasites were observed in neutrophils (C) and monocytes (D) in those animals infected in the presence of L. longipalpis SGS. Insets indicated by white arrowheads shows details of parasite inside parasitophorous vacuoles (PV) outlined in white (50X-fold increase). P- parasite. Viable parasites inside infected neutrophils (E) and monocytes (F) were enumerated by electron microscopy and presented as parasite viability index calculated as described in Methods section. (*, p < 0.05 and Mann–Whitney test, two-tailed). Effect of L. longipalpis saliva on PGE2 production and L. infantum infection ex vivo. To assess if the manipulation of the eicosanoid balance driven by SGS is important to L. infantum infection in vivo, we inhibited pharmacologically the PGE2 production by using a cyclooxygenase-2 (COX-2) selective inhibitor NS398. The inhibition of COX-2 decreased the number of viable parasites in peritoneal cells after L. infantum infection in the presence of SGS (Figure 5). Taken together, these findings suggest that the balance between PGE2 and LTB4 levels induced by L. longipalpis SGS is associated with increased L. infantum infection. Ciclooxiganese-2 inhibition affects the parasite viability in vivo during L. infantum infection in the presence of SGS. C57BL/6 mice were treated with DMSO (vehicle – Veh) or NS398 2 mg/kg. After 1 h of treatment, mice were injected i.p. with L. infantum and SGS according to methods. Viable parasites counting recovered by total infected peritoneal cells after 1 h L. infantum or L. infantum plus SGS inoculation. 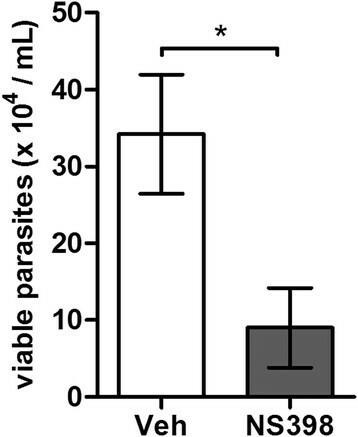 Graph shows viable parasites counting recovered by total infected peritoneal cells. The data are the means and SEM from one experiment representative of three independent experiments. n = 5 per group. (*, p < 0.05 and Mann–Whitney test, two-tailed). Sand fly saliva displays an important role in the first steps of Leishmania infection, as it induces cellular recruitment to inflammatory site, inhibits proinflammatory cytokines and deactivates dendritic cells to mobilize regulatory T cells . Previous studies have shown the participation of eicosanoid in the inflammatory response triggered by sand fly saliva ,,. Here, we show for the first time that saliva can modulate eicosanoid profile with a balance skewed towards COX-2 driven PGE2 over LTB4 at early time points post L. infantum inoculation, possibly benefiting infection. PGE2 production favors the establishment of several pathogen infections . PGE2 drives L. donovani infection in macrophages via PGE2 receptor 2 (EP2) activation . In rats and mice, Trypanosoma cruzi infection induces PGE2 by macrophages -. During Mycobacterium bovis infection, the increase of PGE2 and TGF-β1 production by macrophages that phagocyte apoptotic neutrophils in the inflammatory site helps the establishment of the infection by this pathogen . In addition, the interaction between human apoptotic neutrophils and macrophages also increases the number of parasite burden in L. amazonensis infection via PGE2 and TGF-β1 production . On the other hand, LTB4 has opposite effects on the inflammatory response. The production of LTB4 is associated to the increase of pathogen killing ,. In the context of Leishmania infection, LTB4 is involved in nitric oxide production and consequently reduction of parasite burden in different cellular models of infection with L. amazonensis,,,. We have previously shown that L. longipalpis saliva promptly activates macrophages to produce PGE2 but not LTB4in vitro and ex vivo. SGS increases PGE2 production by neutrophils during L. infantum infection . Here we demonstrate that L. longipalpis SGS reduce the early LTB4 production during L. infantum infection whereas it orchestrates an anti-inflammatory response by increasing PGE2 production. Accordingly, in a hamster model of human VL, a role for early PGE2 in L. donovani dissemination and impairment of NOS2 was demonstrated ,. The inoculation of L. longipalpis SGS plus L. infantum increased parasite viability inside peritoneal cells. The pharmacological inhibition of COX-2 reversed the effect of SGS on enhancing parasite viability. COX-2 expression can be stimulated early dependent upon stimulus, but we do not discharge the action of NS-398 on COX-1 activity. These data strongly suggest that the presence of sand fly SGS favors an anti-inflammatory balance in the PGE2/LTB4 axis which could facilitate the parasite transmissibility and infection in vivo. Despite the lack of data about eicosanoids during later stages of L. infantum infection, recent publication of our group shows increased plasma levels of PGE2 in patients with localized and diffuse cutaneous leishmaniasis when compared to healthy individuals . Moreover the lesions of these patients present high levels of COX-2 enzyme and other enzymes associated to prostaglandin production , suggesting that eicosanoids balance can be important during different stages of the disease. In summary, our findings demonstrate that the eicosanoid profile induced by sand fly saliva plays an important role in the inflammatory modulation during early stages of L. infantum infection and point out potential implications of the PGE2/LTB4 balance in the immunopathogenesis of visceral leishmaniasis. VMB, PTB, AB and CB are senior investigators from the CNPq. The work of BBA was supported by the Division of Intramural Research, National Institute of Allergy and Infectious Diseases, National Institutes of Health. The content of this publication does not necessarily reflect the views or policies of the Department of Health and Human Services, nor does the mention of trade names, commercial products, or organizations imply endorsement by the US Government. The funders had no role in study design, data collection and analysis, decision to publish, or preparation of the manuscript. This work was supported by the Brazilian National Research Council (CNPq) INCT/CNPq [Grant number: 57.3879/2008-7] (VMB); The Brazilian National Research Council (CNPq) [Grant number: 478480/2013-0 (VMB) and 202109/2010-0 (TAS)]. We thank Edvaldo Passos for technical assistance with the insect colony and Dr. Adriana Lanfredi for electron microscopy support. TAS, DBP, BBA, AB, CIB, PTB and VMB conceived and designed the study, contributed with data analysis, drafted and revised the manuscript. TAS, DBP, JFC, NFL and JCM performed the experiments. TAS, DBP, BBA and VMB wrote and revised the manuscript. All authors read and approved the final version of the manuscript.